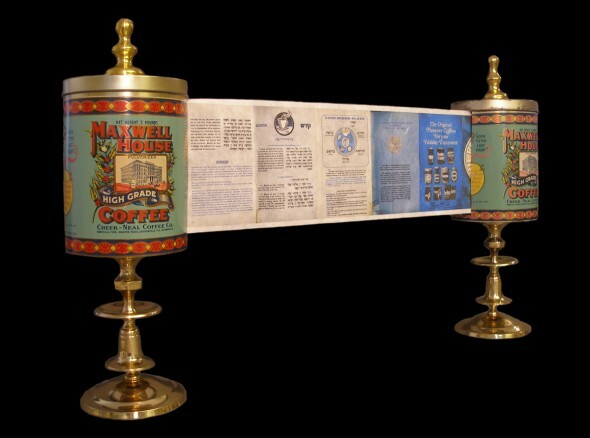 Larry grew up (as have many Jewish Americans) using the Maxwell House Passover Haggadah. 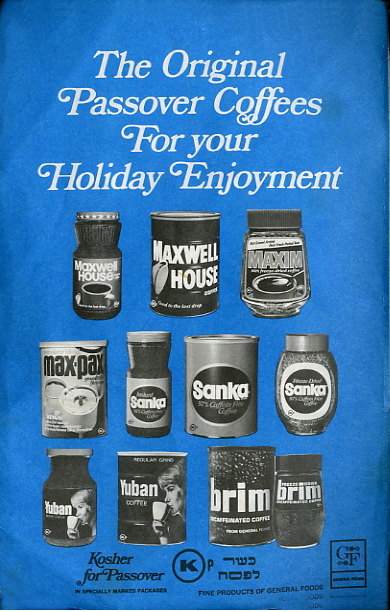 This publication was actually used to reinvent coffee as a kosher food in order to boost coffee sales at holiday time. 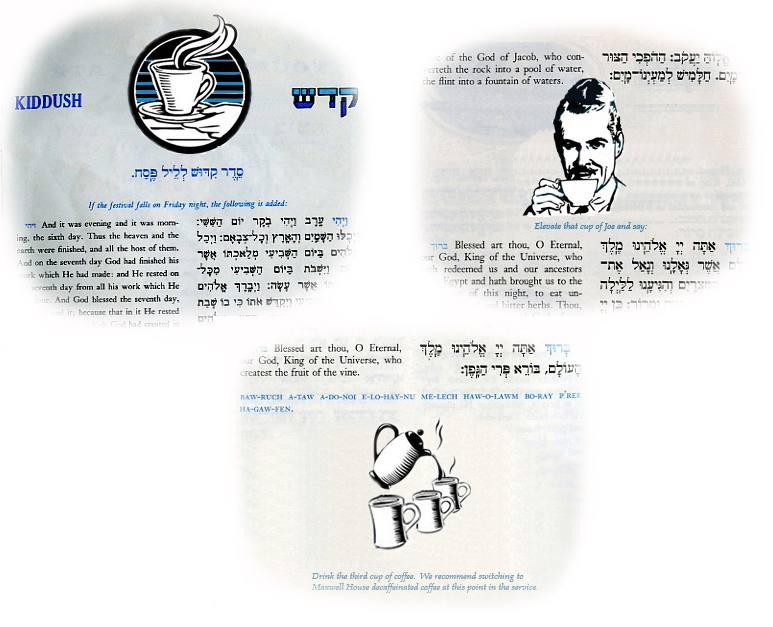 Joseph Jacobs, the owner of Maxwell House brand, hired an Orthodox rabbi to certify that the coffee bean was technically “more like a berry than a bean and, consequently, kosher for Passover.” These promotional Haggadot were then given away for free at grocery stores leading up to the high holidays. It seems an oddly incongruous combination of religious text with a marketing campaign, but it’s use of English and transliterations made this the quintessential American version of the Passover Seder. A page of the original Haggadah circa 1964 can be seen at right. Our version, which pushes the marketing even further, can be seen above. A Kiddush with the new and improved fruit of the vine and a plea to switch to decaf at this point in the service. Since the coffee bean was essentially reclassified as “more like a berry (or fruit) than a bean,” it seems a small stretch to also redefine it as a “fruit of the vine.” Since wine in the Haggadah is referred to as “fruit of the vine,” Maxwell House coffee could be substituted for wine. This would allow advertisements to appear within the text used during the seder as seen in The New Maxwell House Haggadah. 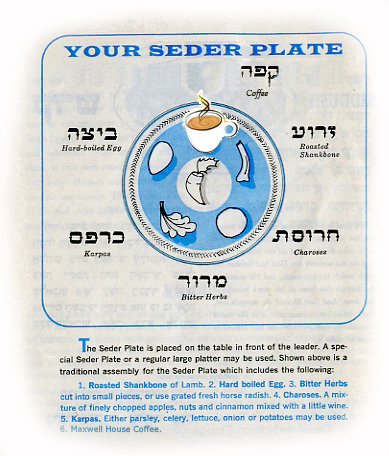 The revised Seder plate - make room for coffee! 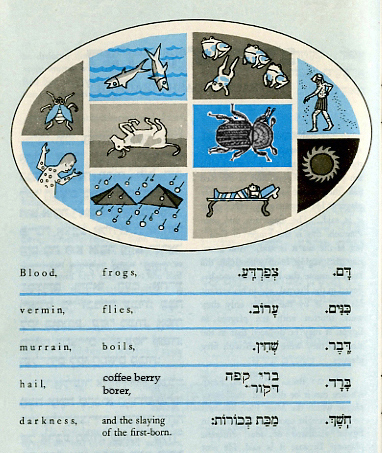 The Ten Plagues with the coffee borer substituted for locusts.